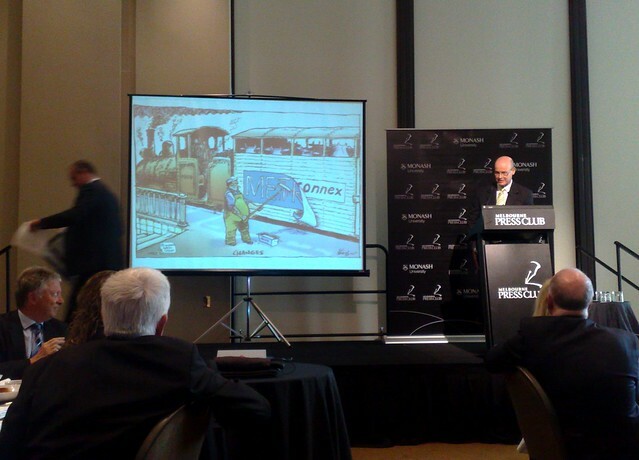 Metro Trains CEO Andrew Lezala addressed the Melbourne Press Club today. I was amused to see they presented him with a framed print of a cartoon from the Herald Sun. Video of the event should be online later. Disclosure — I attended the lunch as a guest of Metro, to lobby on behalf of PTUA members. I noticed TV cameras hovering around at one point. Hope footage of me stuffing my face doesn’t make it to air. More importantly, what was the food like? And was goog provided?